If you spend time near the indoor pool, you may hear disembodied and echoing laughter. The pinball machine on an upper level has been known to play by itself. 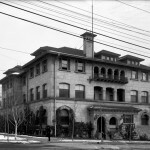 It is said that the hauntings may stem from an incident in which a mother and daughter threw the rest of the siblings off of the balcony and then jumped off themselves while, at the same time, the father was in a nearby canyon committing suicide by carbon monoxide poisoning with a hose attached to a car tailpipe. I just wanted to let you know, the oldest daughters name is rachael. She lived. My mom was her nurse. She did not jump. She was pushed off by her mother who first forced her to throw her siblings off. The father made her mom believe he was god and told her to throw the children off the balcony and then jump herself. Rachael lived only because her body caught on the sixth floor balcony which tore her from her crotch to her ribs. She lived…. if you call it living. She was a very sweet girl when my mom was her nurse. I remember this story in the news exactly how you say it. I would love to know how Rachael is doing today. So sad. I’m sure there is not enough therapy in the world that could help poor Rachael. This is just awful from every angle. Bless her heart.